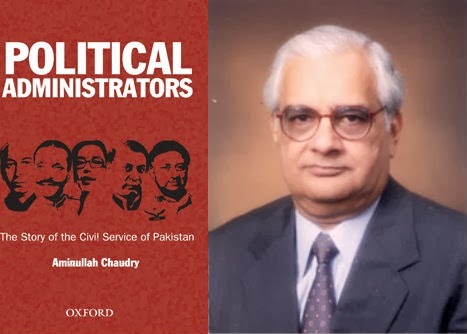 Political Administrators is the title of book authored by Late Aminullah Chaudhry in 2011. This book sums up the story of Civil Service of Pakistan, from British Raj days to modern day Pakistan. Aminullah Chaudhry was born in 1944; He was inducted in Civil Service of Pakistan (CSP) in 1967. Throughout his career, He served at many posts ranging from Deputy Commissioner Shiekhupura, Commissioner Lahore division, Finance Secretary of Punjab, Principal Secretary to caretaker Prime Minister Mairaj Khalid and Director General of Civil Aviation Authority (CAA). He was the head of CAA on 12th October 1999, when the plane carrying General Pervez Musharraf was prevented from Landing in Karachi. Aminullah Chaudhry was also nominated in Plane Hijacking case but he was later acquitted by the court. This book journeys through Civil services in Pakistan from pre-partition days to date. Mr. Aminullah has not only shared his experiences in Civil services but he has also discussed the history of civil services in ample detail. The book contains information about the fore-runner of CSP which is Indian Civil Service (ICS). ICS was established in 1853, to recruit officers to serve in India. At the time of partition the senior most officers that opted for Pakistan were Iskander Mirza and Ikramullah both were Joint secretaries in Defense and Foreign affairs departs of united India Respectively. Iskander Mirza later became Governor of East Pakistan, Interior Minister of Pakistan, Governor General and finally President of Pakistan. Chaudhry Muhammad Ali who also became Prime Minister of Pakistan was the founder of CSP in Pakistan. He was the Secretary General of government of Pakistan and in this capacity He formed CSP in 1950. Apart from that, this book contains treasures of other information about civil services of Pakistan which are interesting to read for anyone who loves reading history. Aminullah Chaudhry went to London and researched in Indian Office of British Library. He has collected authentic data about civil services and used that data to write this marvellous book. Apart from the main chapters of the book, it also contains several appendices. These appendices lists; the names of all people who were inducted in CSP from 1947 to 1971, all military officers who have joined CSP till 2006, all CSP officers who were forcefully removed from office and so on. This book therefore serves as an authentic reference book for researches as well. CSP officers have played a key role in governance history of Pakistan. The Heyday of CSPs started with the regime of Malik Ghulam Mohammad as Governor General. Ghulam Mohammad was himself a CSP and a deputy secretary at the time of partition in Finance department of United India. CSP officers reached their pinnacle of power during the time when Iskander Mirza was in Power. Iskander Mirza made no bones about the fact that He was more comfortable with CSPs then politicians. Ayub Khan sacked 12 CSP officers when He seized power in 1958. Most of these officers belonged from former United Province of British India. Yahya Khan followed the example of his Patron Ayub Kahn and sacked over 80 CSP officers. Next was the turn of civilian dictator Zulfiqar Ali Bhutto who also sacked 23 CSP officers. The induction of Army officers in CSP increased in Bhutto’s regime, Zia-ul-Haq and Pervez Musharraf continued this practice. Dozens of Army officers were relived from their Army commission so that they can join CSP directly without any test or interview. There are a lot of facts which are otherwise lesser known that this book brings to light. This masterpiece by Aminullah Chaudhry virtually acts as an encyclopedia on CSP affairs. Author has also shared dozens of his anecdotes with the readers, which are interesting to read. Author has written that in 1975, Bhutto was coming to Shiekhupura to address a political gathering. Author was deputy commissioner of that city so it was his duty to make arrangements for gathering people to listen the speech of Premier Bhutto. After meeting with local PPP members, Aminullah Chaudhry realized that PPP can’t bring much people to the rally. Author narrates that a road block was put on G.T road near Muridke and all traffic coming from Rawalpindi to Lahore was diverted to Shiekhupura. Passengers of public buses were then technically forced to dismount the buses and attend the rally. In this way thousands of people were gathered which were addressed by Bhutto. That’s a sneak peek into how bureaucrats help the politicians in putting a show of political power. This book is very well written, contains loads of useful information and interesting anecdotes but there are some shortcomings as well. The main criticism which anyone can make on this book is that Author has indulged in practice of self glorification and completely over looked any wrong decisions that He ever took while serving as CSP. Every person makes mistakes, some commit blunders but not everyone acknowledges them. Same is the case with the author who has not written anything in this book which can amount to self-criticism. Most of the famous autobiographies do contain criticisms in which the authors accept their mistakes. Unfortunately, Author of Political Administrators didn’t follow this practice and one has to rely on other scholarly works to explore any criticism on the author as a CSP. Despite, its shortcomings this book is a treat for the history lovers. It leaves a long lasting impression on the reader and especially the interesting anecdotes shared in the book are a delight. One might criticize the author for his role as a CSP officer or dispute his views about politicians or fellow CSP officers but surely no one can deny the remarkable effort undertaken by the author to write this book. Anyone who inspires to be a government servant or has interest in CSP history can’t afford to miss this book.